I guess it depends what blog you are reading as to whether the following statistic is considered cool or scary: twenty-three per cent of children age five and under are active internet users. I’ll let my position be known from the outset – scary, very scary. 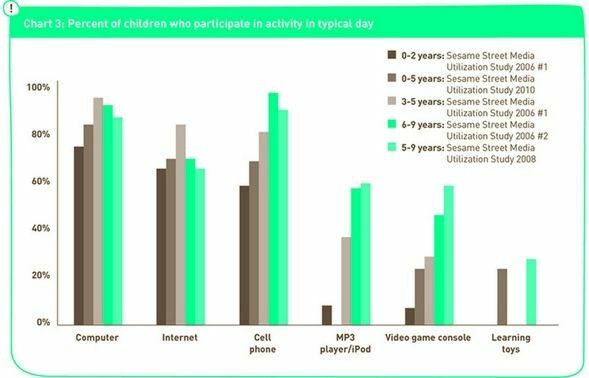 According to a recent study undertaken by education non-profit organisations Joan Ganz Cooney Center and Sesame Workshop, approximately twenty-three per cent of children aged five and under use the internet, most of those on a weekly basis. It begs the question, why?! Apart from the obvious concerns (why aren’t they at the playground, reading books or playing with their toys), why are three-year-olds online? Updating their Myspace page? Downloading some Frances England tracks from iTunes? Checking to see whether they are the winning bidder on the Wiggles playhouse they spotted on eBay? Declare me a ‘mean mum’ but in my experience, computers and pre-schoolers don’t mix. In fact, after sitting through an informative cyber-safety presentation at my children’s school recently, I’d like to put the handbrake on my kids being online until they are much, much older (like twenty). The report also revealed that young children are increasingly consuming all types of digital media, often more than one type at a time (so they’re flicking through an e-book on their iPad while chatting on Skype to grandma). As you might expect, television is the greatest digital ‘consumable’ – the research revealed that in the US, most children spend at least three hours a day watching television. Of the time that children spend on all types of media, television eats up almost half (and I think we can safely assume that the definition of ‘media’ does not include an old-fashioned browse through the newspaper!). Reassuringly, time spent reading books remains constant even as screen time increases. That said, I’m off to busy myself with a book review for next week’s ‘Sunday Arts‘ section.